Where do your Red Tents meet: The Red Wisdom Hearth is located in a garden room, surrounded by tall trees and a stream in the countryside. 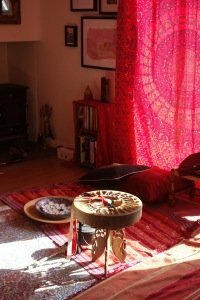 The room is filled with gorgeous red drapes, a sofa, rugs, cushions and lanterns, seating about 12 women. There is a library of wise women’s books to browse whilst you are here, a log-burner in the hearth, and a massive red teapot! The house is nearby with toilets and parking for approximately 8 cars. Parking for more is available up the road. We often sit outside with a fire to warm us under the full moon. When do you meet: We meet close to the Full Moon (to compliment the Herefordshire Red Tent which meets at New Moon). Do you ask participants to bring anything, wear red or make a donation? : Women are welcome to wear whatever expresses where they are in their life stage or menstrual cycle (if they have one). They are invited to make a donation or bring a snack to share, but this is not obligatory. Transgender women will receive a warm welcome here. A safe and sacred space to share our stories and our truest selves.